Today we are headed to the Washington side of the Columbia River Gorge! Rather than waterfalls, today we are in search of wildflowers and awesome views of the Columbia River Gorge. At Catherine Creek, take the Arch Rock Loop for historic buildings, Gorge-ous views, and wildflowers-galore! This rocky trail includes a spring wildflower display and explores a massive rock arch important in Native American history during a hike on the eastern side of the Columbia River Gorge. Located on the Washington side of the Gorge just across from Hood River, the hike features oak savanna characteristic of the drier climate. A carpet of wildflowers appear during March, April and May and include camas lilies, balsamroot, lupine, prairie stars and many others. 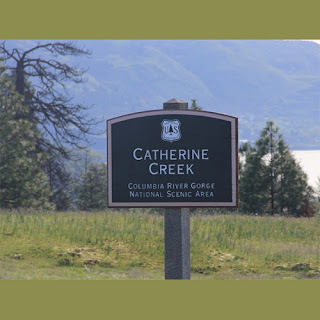 The Catherine Creek area actually is home to three different trails. The Arch Rock Loop is the best hike here but requires a bit of navigation. The loop is 2.1 miles with 481 feet of climb. From the trailhead, the route follows a combination of trails and closed roads past a rock arch, a bubbling creek, an old homestead, epic views of the canyon and Mount Hood, along with more types of wildflower than you can count. A map and more detailed directions of the hike can be found here. Directions: From I-84 in Hood River, take Exit 64, and drive north across the Hood River Bridge ($1 toll for passenger cars). Turn right onto Washington Highway 14, and drive east for 5.8 miles. Turn left at Rowland Lake onto County Road 1230 (Old Highway No. 8), which follows the north end of the lake. In 1.3 miles, a large and well-marked trailhead arrives on both sides of the road. The hike starts on the left trailhead (a paved trail down to the Columbia is on the right).